This year is the tenth anniversary of Celebrate Asia, an annual event presented in collaboration with Seattle’s Asian communities. Drums thunder from the balcony and dancers whirl past in bright splashes of color. Dragons weave through the crowd and people burst forth in moments of spontaneous dancing. It’s all part of Celebrate Asia, the Seattle Symphony’s annual concert honoring and celebrating Seattle’s Asian communities. 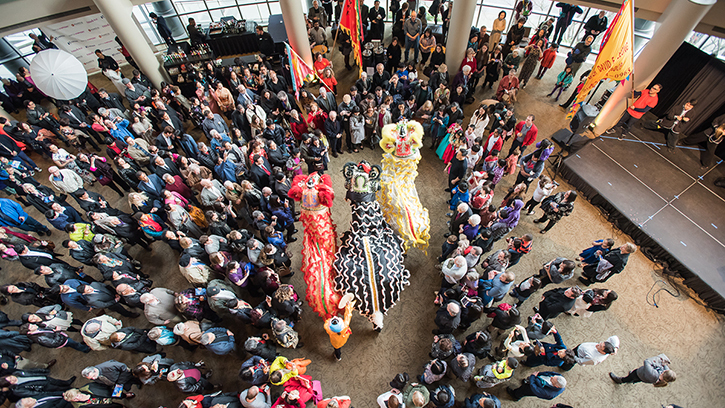 This year is the tenth anniversary of Celebrate Asia, which has drawn more than 19,000 people to the Seattle Symphony and Benaroya Hall since it began in 2009. The concert was the vision of Seattle Symphony Lifetime Director Yoshi Minegishi, who approached the Symphony with the inspiration for the concert. Although he took piano for many years, he admits that “sports were my thing.” He moved to Redwood City, California when he was 16 to pursue his real love, tennis, earning a scholarship to play at Stanford University before starting work at IBM. “Then in 2000 I came to Seattle and felt that it was time to pay back all my luck, the lucky life that I’ve had,” says Minegishi. The first concert opened to a sold-out audience and featured a side-by-side performance with the Seattle Youth Symphony Orchestra as well as solo appearances by Chinese and Korean artists. “The whole community showed up,” smiles Minegishi as he recounts the first concert. Many other Asian countries have been represented on the main stage throughout the years, as well as in the pre- and post-concert performances. In the 2010–2011 season, the Symphony introduced a composition competition as part of Celebrate Asia. The competition recognizes emerging composers who are influenced by Asian culture, music and traditions. This year, Celebrate Asia will feature one of the soloists from the very first concert: Warren Chang performing a solo on the Erhu, a Chinese stringed instrument. The program will also feature Indian composer and soloist Nishat Kahn performing his Concerto for Sitar and Orchestra. In the second half of the concert, the Seattle Chinese Orchestra will join members of the Seattle Symphony for side-by-side performances. The members of the orchestra play traditional Chinese instruments as well as the cello and double bass, which add depth and blend to the ensemble. The two orchestras will play arrangements of traditional Chinese folk songs. Get tickets today for the Seattle Symphony’s tenth annual Celebrate Asia concert and celebration on February 11, 2018! Thank you to the Celebrate Asia committee: Viren Kamdar and Martha Lee, co-chairs, with Vivi Cooper, Greg Dwidjaya, Mariela Fletcher, Anjali Joshi, Eunju Kim, Pankaj Nath, Kim Long Nguyen, Akemi Sagawa, Ravi Sanga, Busbong Sears, Yuka Shimizu, Julie Sun, Susanna Tran, Esther Wu and Ruoxi Zhang.